A couple of days ago I posted a link on Facebook about a tiny house project that is here in Colorado as well as a post from this very blog about my cabin adventures over the 4th of July weekend. 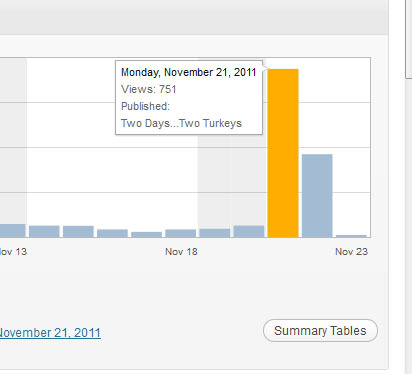 I was surprised today to see that my former record of “views” for the day was shattered. A new record was set at 751 . Last year I posted a blog about Boulderites and how selfish (arrogant , entitlement rich, etc) they are. These were based on my direct observations during a somewhat minor snowfall ( 2″) I referred to that post via the Rag of the Daily Camera, It had 351 views…and some chert responses….oh those Boulder folks can be a bit on the testy side…. Tiny houses seem to outweigh low IQ Boulderites by a 2 to 1 margin. No surprise in my book but nice to see none the less. Don’t get me wrong some Boulder folks are great, and In fact I worked at a couple of my Boulder Clients home’s there today. Its just the attitude of some that ruin it for the rest. The track back data from here (530 views) on the cabin post came from Facebook. I was surprised that Facebook has such a following. Tomorrow I have some minor errand s to run up here in the Mountains and then I need to run the Girls back to the Ex for Turkey Day. Tori and I will be heading out to the cabin for the longish weekend. I hope to get some more T&G siding up inside, as well as some more tile work, and hopefully some tyvek on the rest of the cabin. The tarpaper I installed on the original build did not last with out siding on top. Getting more Hardiplank is not in the budget for this trip.